You read that right, folks: Exxon CEO Rex Tillerson thinks students are "products" that he gets to "consume." Any idea that the American education system might have a purpose other than producing human "products" for corporations is not even worth considering. This is the sort of thinking that leads corporations like Exxon to have such regressive records on things like LGBT rights and workplace safety and climate change and environmental protections. It's the sort of thinking that justifies insanely low taxes on those same corporations. It's the sort of thinking that rationalizes salaries for their CEOs that are so large they become disconnected from the reality of the American middle class. It's the sort of thinking that normalizes the wholesale buying of our political system. But it's also the sort of thinking that has seeped into mainstream media reporting on education. Schools, you see, aren't the bedrocks of democracy, which requires a well-educated, well-informed electorate capable of critical thinking. Schools aren't civic institutions around which out society organizes itself. Schools aren't even places where individuals go to realize their potential. No, schools produce a product: workers. And if the product isn't "good" enough -- or, just as important, cheap enough -- "consumers" of workers like Rex Tillerson feel they have every right to demand that schools start making the "products" with the "quality" they and their shareholders crave. It's a bizarre way of looking at children, particularly for those of us who spend our days teaching them. But if you can get past your nausea, Tillerson's quote is actually quite instructive: this really is how the corporate world thinks about education. Which means that when a reporter like Peter Elkind -- whose article doesn't include even one quote from an actual educator or pedagogy researcher -- focuses solely on how education policy is viewed through the lens of corporate leaders, it's not a surprise that he is encumbered by a framework that doesn't even address some of the core issues in contemporary education policy. For decades, CEOs have bemoaned the state of U.S. education—with justification. American 15-year-olds ranked 27th out of 34 industrialized countries in math, and 17th in reading in the most recent international tests. Colleges complain that significant percentages of their entering freshmen require a remedial course. Businesses say they can’t find enough skilled U.S. workers. - Even if we set aside the serious concerns about the PISA test's validity and selective sampling, it is arguably an indicator more of societal inequity than educational effectiveness. - The college remediation rate is not solely affected by the effectiveness of the K-12 system. Further, the system for targeting students for remediation is wide open to critique. - Even the vaunted STEM graduates are having a hard time finding jobs. The problem for business may well be that they don't want to dip into their huge profits and start spreading them around to their workers. Now, you may agree with the above; maybe you don't. But if you read Elkind's article, you won't even get an idea that there is a debate over any of this; that's because his guiding thesis -- that American education serves American business -- doesn't allow for any counter-narratives that challenge the premises of corporate-style education reform. This is why Elkind sees the battle over the Common Core as a fight between the corporate right and the libertarian/social conservative right. Those with well-informed, substantive criticisms of the Common Core aren't actually included in his piece, because their objections are not germane to a worldview that sees education as nothing more than a tool used in the service of capitalism. Again, you may or may not agree with these critiques of the Common Core, but the argument over the educational value of the standards isn't the issue for Tillerson and his fellow CEOs. They need their workers, they need them cheap, they need them competent, and they need them now. That's the framework Elkind operates from -- a framework that has no need for an exploration of why there has been such a pushback against the sort of education "reforms" that have been funded by Tillerson and Bill Gates. Let me be clear: without question, there has been a loud, sustained outcry against the Common Core from the Tea Partyin' right. Largely, this protest has been ill-informed; I'd be the last person to defend anything Glenn Beck or Gayle Ruzicka had to say about, well, anything. But when Elkind conflates their objections to the Gates/Tillerson style of "reform" with those of Glenda Ritz -- the state superintendent of schools in Indiana who defeated reformy poster boy Tony Bennett -- he does his readers a real disservice. The fact that Elkind can't even mention Ritz by name, let alone describe her rather complicated views of the Common Core, shows how little interest he has in telling his story with even a small amount of nuance. Every president since Reagan has flailed at this issue. George H.W. Bush and Bill Clinton convened special education panels and launched commissions in unsuccessful attempts to establish voluntary national standards. Finally, the Clinton administration was able to pass a watered-down initiative that required states to adopt standards and tests—but left them entirely up to individual states. In Elkind's world -- the world informed by Gates and Tillerson -- the primary difference between Massachusetts and Mississippi is in their standards. If we just force Mississippi to set its sights as high as Massachusetts', everything will fall into place. Except, as I've shown before, the notion that standards by themselves can induce better performance from students on tests is simply not supported by the facts. Yes, there's little doubt some states set their standards low. But this wasn't done arbitrarily: many of these states set low standards to cover up the fact that their states weren't willing to pony up the money necessary to equalize education funding between affluent and impoverished communities (even Arne Duncan has started to figure this out). At the risk of oversimplifying: Mississippi is much worse at distributing resources for education than Massachusetts. In addition, Mississippi has a much higher child poverty rate than Massachusetts. The effect of poverty on school outcomes is not subject to debate; why, then, doesn't Elkind address it in his article? Go ahead: search his post for the word "poverty." See what comes up. While you're at it, see if you find any mention of the fact that the majority of America's states are providing less funding to public schools than they were before the last recession. How, exactly, are schools supposed to achieve the allegedly higher standards of the Common Core without even the funding they got under their old standards? Maybe you think our schools are wasting money and have all they need to be awesome, in spite of the fact that many aren't even funding their own laws when it comes to school funding. OK -- I think you're totally misguided and the facts are completely in my favor, but fine, we can debate. But not if you're in Peter Elkind's world -- the issue doesn't even come up. I know I'm going to piss off some people by saying this yet again -- and that includes some people I genuinely respect. But the debate about the Common Core is largely superfluous. Yes, we need well-written, rigorous standards that are developmentally appropriate. I have my doubts as to whether the Common Core standards are the ones we want (pi introduced in Grade 7? Seems late to me...), but, as I've said before, I'm not the guy to lead that discussion (I wish others shared my humility). 1) Pay for schools that can implement them. 2) Reconfigure our society so all children arrive at those schools with full bellies, good health care, and adequate community infrastructure so they are ready to learn. Rex Tillerson is willing to spend money to run commercials during the Masters tournament to promote the Common Core. Is he willing to change US law so Exxon can be taxed at rates that provide enough funds to address America's 22 percent child poverty rate? According to Elkind, Tillerson was willing to threaten state legislatures with the withdrawal of his company if they didn't get in line with the Common Core. Is he willing to write letters threatening to pull Exxon out of states that don't follow their own laws when it comes to ensuring adequate and equitable school funding? If journalists like Peter Elkind were willing to open up their contact lists to people other than CEOs and right-wing think tanky types, perhaps they'd think to ask folks like Tillerson these rather basic questions. ADDING: Corporations exist solely through the grace of the American electorate. I think it's more than fair to say that Tillerson has it backwards: we allow Exxon-Mobil to exist to serve us. And if they are producing a defective product, we have the right to demand that they stop. Please leave our children alone. We do not need you to develop them as products. They are neither kerogen nor shale. Your Dickensian thinking has been “outed” and this holiday season, you are as welcome as the ghost of Christmas past. The common-folk for whom the Core you adore was designed, do not like it—only 24 percent of public school parents want it used in their school. 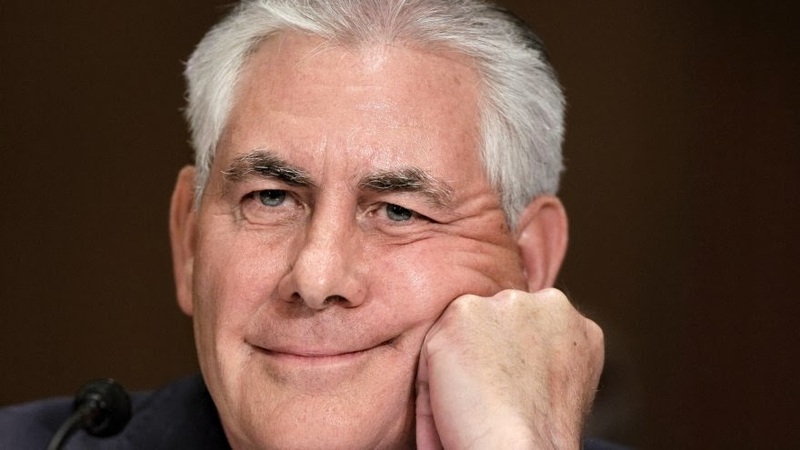 And they certainly do not like to hear their children referred to as “defective products.” Mr. Tillerson, you have made the mommies and daddies mad. 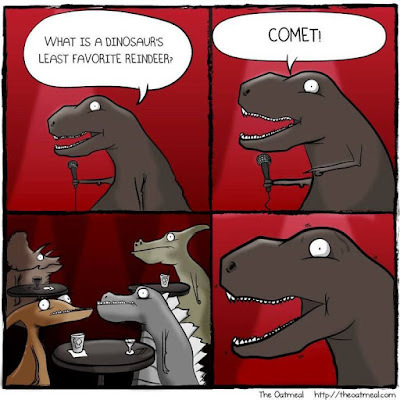 I understand their reaction must confound you. In a world in which your corporation has been declared a person, one might mistake human children for products to consume. When we humanize the inanimate, it is easy for the humanity of the animate to slip away. But let me make this clear — our children are not products for your purchase. You, and the captains of industry (or whatever you call yourselves this century), are not “the customers.” School is not a training camp to work on oilrigs, to pump gas or design lubricants. There is just enough democracy left to make students know they have choices, and more than enough parental commonsense left to know that community control of schools is slipping away. We are so sorry to disappoint. It's the N annual Jazzman Christmas Music Festival! Starting with America's greatest composer, Duke Ellington. "I pay more to hear my band than anybody." Bill Evans next, with huge props to Williams Hughes for the transcription. Booker T & the MGs lay down the Christmas groove. A little different take from Mandy Patinkin. I didn't "get" him years ago, but I've really come to appreciate his voice over the years. How about some Aaron Neville? The Kinks were a bunch of smartass punks long before anyone had heard of the Beasties or Green Day. When I was 16 I was obsessed with Keith Emerson. Then I found out who he listened to. There's an incredible/horrible story about Emerson and Smith meeting I can't find on line; I'll keep looking. It's the 50th anniversary of A Charlie Brown Christmas, which would never have been as great as it is without the music of Vince Guaraldi. I promise I'll get back to Teachers Village in a bit and wrap up that series. But recent events have got me thinking more about the intersection of democratically elected school boards, local control, race, class, and charter schools. Because the argument I often hear from the "reform" industry is that people like me have no business expressing our skepticism about charter schools (nor should we ever dare to call out the incoherence of those who make poor cases for chartering) because charters represent a "choice" that urban families of color -- who are often at economic disadvantage -- make, and no one has the right to take away that "choice" if the only alternative is a "failing" school. Charter "choice" is not suburban "choice." Shuffling children around within the borders of their district into schools that have unequal access to resources and unequal commitments to educating all students is not the "choice" offered in the suburbs. Offering families either underfunded, crumbling, filthy public schools or charters that are not state actors and do not afford students and parents the same due process rights is not the "choice" offered in the suburbs. Requiring students to submit to excessive punishments for trivial infractions is not the "choice" offered in the suburbs. That said, I'd like to step back a bit and think about another difference between affluent suburban schools and less affluent urban schools. It's becoming increasingly clear that the cost of a "choice" system of schools is democratic, local control of that system -- a privilege increasingly being denied to citizens in urban communities of color. Let me start by saying first that I'm hardly naive enough to believe that local control is always going to lead to good governance; we have enough examples of local system failure right here in New Jersey to dismiss that idea outright. States have a duty to intervene when local school boards are behaving badly. But school governance often moves away from local communities not on the premise that local authorities are engaging in malfeasance, but that better outcomes will be realized if control is either moved to a larger governing body, or given over to the executive. That's been the argument, as I read it, in Chicago, New York City, and Philadelphia for moving school governance away from locally elected boards and towards a big-city mayor or the state. And what do all those communities have in common? An explosion of charter schools. It's as if the people in charge are saying to local communities: "Look, we can't trust you to make decisions about how to structure and oversee your school system. But we'll trade you that control for parental control over where to enroll a child. Of course, we'll control the menu of options for that child, and we'll run the oversight system, and we'll maintain control over the consumer information parents will use to make their choices, even if that information is flawed." Again: is this actually "choice," or is there something else going on? I'm starting to look at this closely; let me share some early analysis using New Jersey as an example. About two decades ago, New Jersey decided several of its districts could no longer govern themselves. Again, part of the problem, admittedly, was some bad behavior on the part of the leaders of these districts. However, there was plenty of bad behavior in other large districts, but they never saw officials from Trenton come in and take over. Why were some districts subject to takeover -- and remain under state control to this very day -- while others were not? If your local school district has a large population of black and/or Hispanic students, it's more likely to be under state control. If your local school district has a large population of students who qualify for free lunch, a measure of economic disadvantage, it's more likely to be under state control. This is so obvious no one even tries to debate it. That said, there is a layer of subtlety that sometimes gets ignored. Because there are plenty of other districts in New Jersey that have many socio-economically disadvantaged students -- the so-called "district factor group" (DFG) "A" or "B" districts -- that aren't under state control. So why Newark, Camden, Jersey City, and Paterson, and not the others? Here's a clue: state controlled districts tend to be much larger than those under local control. A word about how I've done this, and what follows: I've "collapsed" the charter school population for each district into the total district population, so it reflects all the students enrolled in the district schools plus all the students enrolled in the local charter schools. Which is a bit problematic, because a charter school can enroll a student from another district. 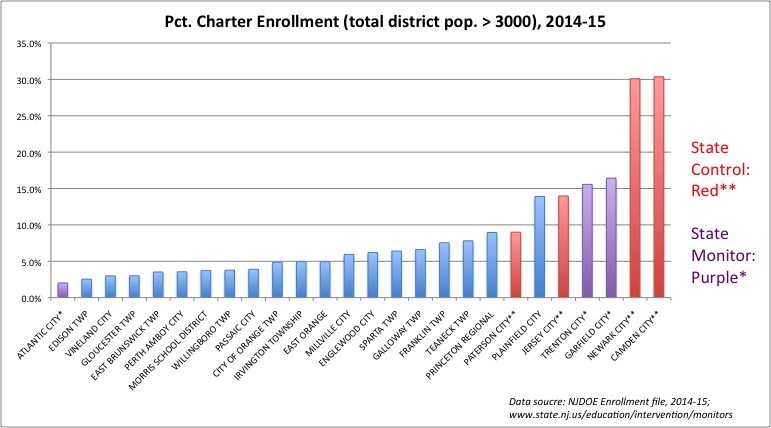 That's not going to affect our accuracy for large districts much as the out-of-district enrollment is proportionately small for charters in large districts; in other words, most of a Newark's charter students live in Newark, so the above is fairly accurate. Still, others' numbers may be somewhat different. 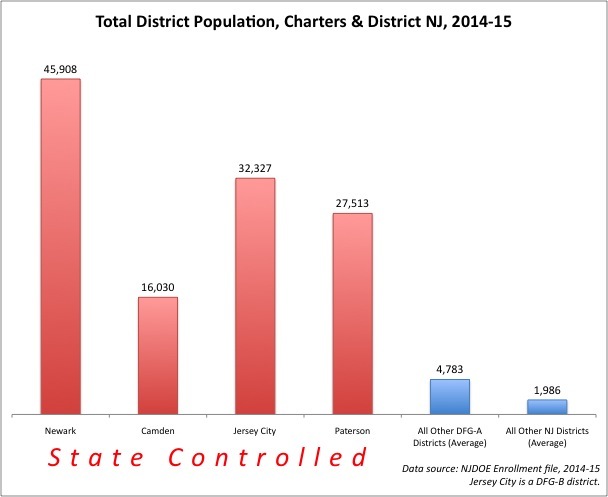 Four of the five largest school districts in New Jersey are under state control. 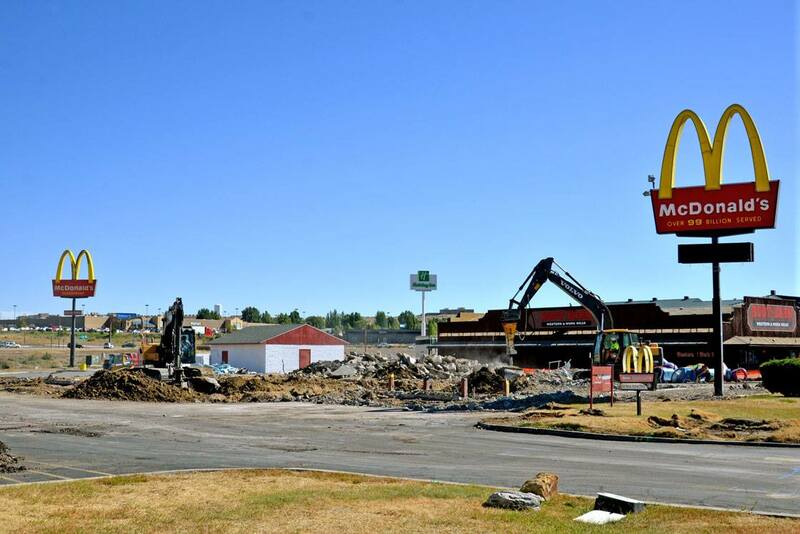 If you had a franchise with McDonalds and you wanted to plan a site for a new restaurant, where would you go? 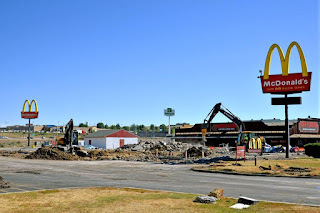 Where the customers are, of course -- but it would be enormously helpful to you if those places happened to have zoning boards that were amenable to bringing in fast food chains. 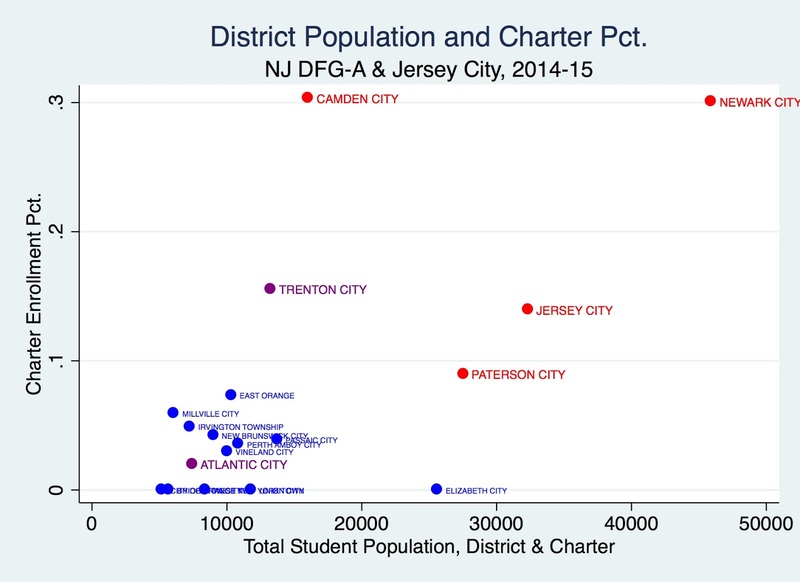 So it is with charter schools in New Jersey: they tend to be clustered not only where there are many students in economic disadvantage, but also places that are under state control, which means they have large "customer bases" of students and local school leaders friendly to the chartering movement. 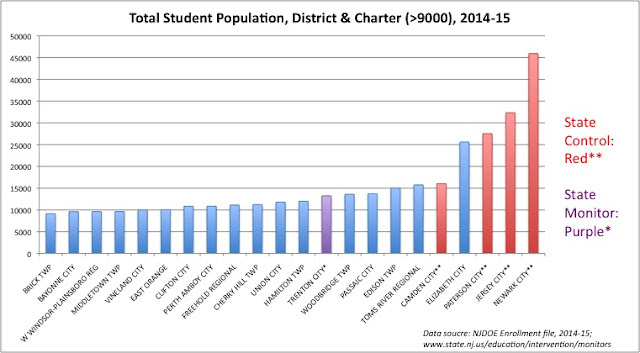 State controlled districts have large charter school populations. Again, these districts are attractive to charter operators for two reasons: first, they have a large population of students, so there are more potential "customers" to market toward. Second, they are controlled by a state government that is amenable to charter school expansion. Let's look at this a couple of other ways. Of all districts that have more than 3000 students enrolled, here are the ones with charter enrollments over 2 percent. 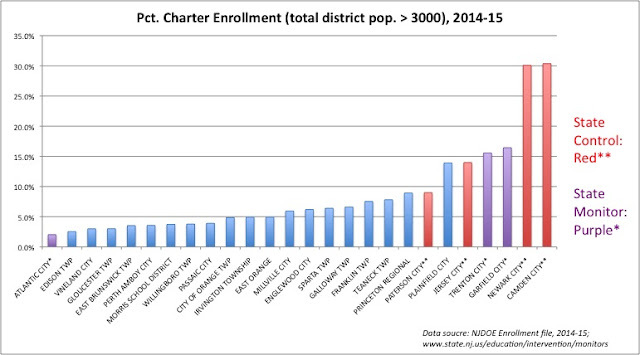 Hoboken is missing here because it's a relatively small district with relatively big charter market penetration, but the rest show an interesting pattern: districts subject to state intervention see lots of their students enroll in charter schools. "State monitor" is a lower level of state intervention; fiscal monitors that report to Trenton exert some governance over schools, but not to the extent of "state controlled" districts. Six of the seven large districts with the largest charter market share have some sort of state intervention. Four of the five largest DFG-A districts are under state control -- and they have some of the largest charter school enrollments by percentage in the state. What's even more interesting is who doesn't have many charter schools. Elizabeth is a very big district, but there aren't any charters there. Trenton and Camden are roughly as big as Passaic, which has a much smaller percentage of charter students enrolled. Union City doesn't have any charters, something David Kirp pointed out in his book on that city's schools. It's also worth pointing out Atlantic City just recently came under a state monitor's watch; what do you think is going to happen there next? In New Jersey, state control and charter schools appear to go hand-in-hand. The question, of course, is "why"? Could it be that local control somehow keeps parents and families from getting the charters they really want? Or is it that charter growth is being forced on communities against their will? Or could it maybe be that state controlled districts are so poorly managed that charters -- even when they are less than impressive -- still look good in comparison? We haven't played Spot The Pattern™ in quite a while. Who's up for a round [all emphases mine]? A nonprofit group has begun a public relations campaign to defend Teach for America against critics of the program that places newly minted college graduates in teaching jobs in some of the country’s most challenging classrooms. The new campaign, called Corps Knowledge, is an offshoot of the New York Campaign for Achievement Now (NYCAN), a network that supports public charter schools and school choice and wants to weaken teacher tenure laws. Derrell Bradford, NYCAN’s executive director, said the campaign aims to counter attacks on Teach for America’s image, which some people loyal to the program think has been damaged by “a few disgruntled alumni” and other critics. Several TFA alumni have written negatively about their experiences, saying that TFA’s five-week training session did not adequately prepare them for teaching in struggling schools and that the two-year commitment that TFA requires adds to the teacher churn in high-needs schools. “Some of the best people I’ve ever known have worked for TFA — great, caring, smart — and it’s tough to see your friends get dragged through the mud,” said Bradford, who has $500,000 for the campaign and is aiming to raise an additional $1 million to expand it. But the new campaign also is answering Teach for America’s harshest critics. Corps Knowledge challenged Rubinstein in a post on its Facebook page called “The Misanthropy of Gary Rubinstein” in which it suggested Rubinstein had given up on low-income students to work at Stuyvesant, one of the highest-performing public schools in the country. “He now simply scorns those who are still fighting the good fight,” the post said. Rubinstein bristled at the comment. Second, Ms. Weingarten is not a force for change, or a passionate actor speaking out on behalf of the voiceless. To the contrary, she is a chief architect of the current system of education, and de facto segregation, in America. She is a champion and co-conspirator in a system that routinely segregates our children by resources, skin color and opportunity. She’s an apologist for low-performing schools that end our children’s lives before they’ve even had a chance to live them. She’s a catalyst for the white-power driven opt-out push, allowing and supporting small groups of affluent white parents as they hold hostage the transparency our schools need to get better — schools overwhelmingly filled with the black and brown children she purports to defend. I want to stress, especially to those lawmakers who have never stepped foot inside a charter school but who may be making decisions about them, that my son is not an easy child. I've heard people who are just not knowledgeable swear up and down that charter schools take only the best kids or encourage the troublemakers or kids with special needs to leave. My son is the poster kid of the child that people say doesn't exist in charter schools. A child with special needs has found success at a public charter school. Good news, right? Not to Bob Braun, a luminary among those who oppose all things non-traditional in Newark or any of N.J.’s chronically-failing school districts. How much of an adversary to reform is Bob? So much that he’ll eschew journalistic integrity and dox* Ms. Levant. It's so Braun; such certainty that poor minority moms are conspiring to corrupt the perfect purity of N.J.'s public education system. I asked Matthew Frankel of PC2E for his thoughts. (PCE2 helped organize the Parent Lobby Day that so offends Bob.) "The voices of parents,” said Frankel, “no matter what their view, should always be respected. Mr. Braun's desire to scare parents away from speaking their minds is pathetic." Did you spot the pattern? If not, you probably work for Education Post, but don't worry: I'll explain. See, when you spend your time attacking Gary Rubinstein for being a teacher at a high-performing urban school, you don't have to address the fact that TFA corps members are sent out to teach in schools serving socio-economically disadvantaged communities with inadequate training -- something even TFA has acknowledged. Nor do you have to address the fact that TFA is a highly inefficient program because so many of its graduates do not stay in their initial teaching assignments. When you spend your time implying that Randi Weingarten is a racist for making a wholly germane comparison between the suspension rates at Success Academy and that horrific assault in South Carolina -- a juxtaposition so obvious that plenty of writers, including those in favor of school "choice," have made it -- then you don't have to address whether SA might have a problem that needs to be acknowledged and fixed. * You can also blow off Weingarten's admission in the very column being criticized that she was wrong about zero-tolerance, and that the problem of racially disparate school discipline is not confined to charter schools. When you spend your time wagging your finger at Bob Braun for demanding better standards of transparency from New Jersey's largest newspaper, you don't have to address the fact that same paper's editorial staff refuses to understand the most basic realities about charter schools -- even when they are explained to them by experts repeatedly. Not do you have to acknowledge they just don't give a crap about getting the facts right. But this is what you do when you've got nothing. I've been following Derrell and Laura for a good long while now. Since it's the Christmas season, I'll be charitable: they are both less than impressive. Laura apparently thinks she has the ability to read the minds of the dead; worse, when their widows point out that Laura has utterly misrepresented their positions, she refuses to back down and apologize. When Laura tries to understand quantitative education research (skip down to the comments), it's like a fish trying to understand general relativity. Derrell is perhaps the most incoherent arguer in the reform industry. His Uber-charter school analogy was so exquisitely bad it deserves to be in a museum. He was extraordinarily ineffective as a lobbyist in Trenton, even as he managed to take on education policy jobs for which he was totally unqualified. 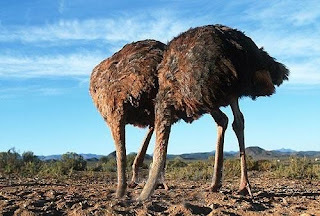 He grouses about Weingarten's alleged complicity in the inequitable distribution of education resources, even as he made a career being an apologist for the underfunding of New Jersey's public schools. And Teach For America is withering on the vine, a victim of its inability to take criticism from its own alumni. Of course, when you spend millions on PR and even more running a political machine, you can pretend that you aren't on life support -- but probably not indefinitely. Look, I'll be the first to admit I can be rough on the reformy types. But I'm not complaining about anyone's tone here: I'm complaining about the ignorance and incoherence of their arguments. If TFA had a reasonable justification for its continued existence, it wouldn't need to beat up a teacher for being a teacher. If Derrell Bradford had any rational justification for Success Academy's discipline policies, he wouldn't need to use Campbell Brown's website to engage in a lengthy smear of a union president. If Laura Waters had any idea of the impact of charter school expansion on Newark's public schools, she wouldn't need to get another case of the vapors over Bob Braun pointing out the Star-Ledger has lax standards of transparency. These reformies have nothing. Which is why their arguments are so very, very lame. Step it up, folks. Don't you get tired of constantly embarrassing yourselves? * I disagree with Rishawn Biddle about almost everything, and I think his gratuitous union-bashing is insipid. That said, this piece is worth reading. And let me reiterate: the idea that this is exclusively a charter school problem is utterly misguided. Racially disparate school discipline is an American problem. Return To Teachers Village, Part III: Who's Learning At Teachers Village? 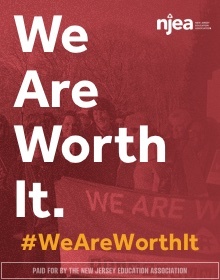 Part IV - What's It Costing Us? Let's ask again: how much money have the taxpayers spent on Newark's Teachers Village? Teachers’ Village represents a complex mixture of innovatively structured public and private financing: $22.7 million of Qualified School Construction Bonds were issued through the New Jersey Economic Development Authority (NJEDA) and purchased by TD Bank; a $4.25 million loan was secured from the Casino Reinvestment Development Authority; and a $1 million loan came from Brick City Development Corporation’s Urban Enterprise Zone Loan Fund, which helped to solidify a unique public‑private partnership with other lenders. The City of Newark provided a $2 million Community Development Block Grant and, in conjunction with the NJEDA, committed $5.3 million in Redevelopment Area Bond financing. 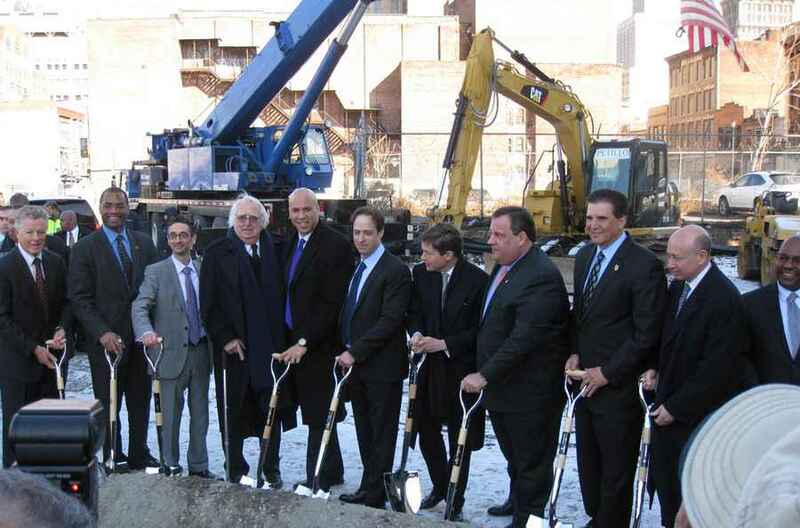 NJEDA also issued $39 million of Urban Transit Hub Tax Credits, which were purchased by Goldman Sachs Bank, and New Jersey Community Capital deployed $10 million of its New Market Tax Credit allocations, which were also purchased by Goldman Sachs Bank. To be clear: that's mostly private financing. However, there were quite a few tax credits given for the project, as well as some outright grants. There's just no way Teachers Village ever would have become a reality without public funding. Further, and most importantly: much of the rental revenue collected by the owners of Teachers Village, the RBH Group, can be traced directly back to public sources. The rents paid by the teachers living in TV come from taxpayer-funded salaries. The rents paid on behalf of the tutors working at Great Oaks Charter School come from AmeriCorps grants. The rental fees from the three charters housed at TV come from the Newark Public Schools, which transfers public revenue directly to charters for every Newark student enrolled. As the Education Law Center just noted, those charter school transfers are having a seriously deleterious effect on NPS's finances (I'll have much more to say about this very important report soon). And yet the charters at TV continue to drain funds from the district to pay their rents. Of course, those rental fees could also be paid with the funds that come from the large philanthropic donations some of these charters receive. But that would be a taxpayers subsidy as well, as every dollar not donated to a non-profit is a dollar that can be taxed. Given the sizable public funds streaming into the development, it's worth asking: who is learning at Teachers Village? Let's take a look at public data and compare the students enrolled at TV's three charter schools to the rest of the city. Free lunch eligibility is the best proxy measure we have for whether a student is economically disadvantaged. I've separated free lunch from reduced-price lunch here as I usually do when studying Newark. The vast majority of Newark's students qualify for free or reduced-price lunch, but free lunch (FL) is a deeper level of disadvantage: 130 percent or below the poverty line, as opposed to 130 to 185 percent. As I noted last time, we don't have data that breaks down TEAM-KIPP's enrollments by campus, so we don't know for sure how many students they have at Teachers Village. Keep this in mind as we continue: the student demographics I show are for all of TEAM-KIPP's schools, not just the one at TV. Still, it's reasonable to think TEAM-KIPP's entire student body is similar to the student body enrolled at TV. Again, Discovery is a very small school; to their credit, however, they enroll the highest rate of FL-eligible students in Newark. TEAM-KIPP's enrollment of FL-eligible children is more like the median enrollments found in NPS schools. But Great Oaks has comparatively fewer students proportionately who qualify for FL, even as its student enrollment is much larger than Discovery's. Let's look next at Limited English Proficient (LEP) students: the students who don't speak English at home and need special services to learn the language. Here the difference is quite clear: Teachers Village has very few LEP students learning in its classrooms. What about those students with special education needs? Special education classifications are done by district, and charter schools essentially run as their own districts. 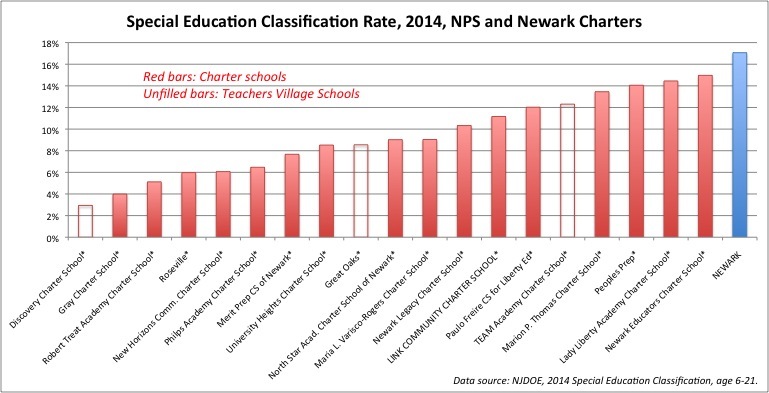 No charter school in Newark educates more special education students proportionally than NPS. TEAM-KIPP has one of the higher special education enrollment rates in the Newark charter sector. But Great Oaks is comparatively low, and Discovery has the lowest classification rate. How does this look in the aggregate? Teachers Village, as a whole, educates more special education students proportionally than the rest of Newark's charter sector (again, that's assuming TEAM-KIPP's TV population mirrors its entire student body). But the schools at TV do not come close to educating an equivalent special education population compared to NPS. 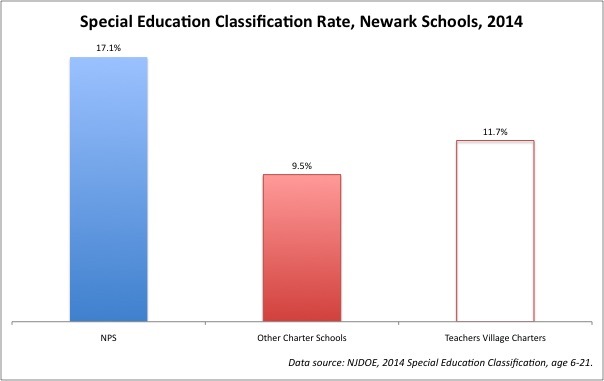 Also keep this in mind: I've shown before that the special education students in the Newark charters are more likely to be classified as having less-expensive disabilities compared to the special education students in NPS. It's fair to say that the student population at Teachers Village is not similar to the student population of NPS: the students in Teachers Village schools are less likely to be Limited English Proficient and less likely to have a special education need than students in the district schools. Free lunch eligibility is a more mixed picture. Discovery has a very high FL percentage, but it's a small school. TEAM-KIPP's overall FL percentage is typical for a Newark school. And Great Oaks has proportionally fewer FL students than most Newark schools. Let me be clear: I think it's terrific that the kids who attend school in Teachers Village get to go to a brand new facility. They deserve nothing less: Newark is a hard-scrabble city, and its children deserve bright, clean, safe schools as much as any other child in New Jersey. But where is the financing and public funding to build new schools for the students who don't go to Teachers Village? Why can't the students who aren't enrolled in these three charters -- students who, on average, are more likely to have a special education need or to speak a language other than English at home -- also move into brand new schools? Where's their taxpayer-backed financing from Goldman Sachs? Where's their Community Development Block Grant? As in Camden, it seems that this state -- and, indeed, this nation -- has plenty of money to go around when it comes to financing the construction of new charter school facilities. Wall Street practically falls all over itself to get in on the charter school building action... and why wouldn't they? Parents in urban centers like Newark have the "choice" of sending their kids to crumbing, filthy, unsafe district schools, or clean, new, air-conditioned charters. Of course many of them will pick the charters -- so long as their child speaks English at home, or doesn't have a profound special education need. That means more and more taxpayer dollars flow to the charters; consequently, they can afford to fund new construction. But it's not real "choice" when the financing for new construction flows to the charters and not the district schools. And it's not real "choice" if the children served by those shiny new charters are different from the children trapped back in the crumbling public schools. Let's talk more about how these public funds are flowing to charters, and then to developers, next. Teachers Village Ground Breaking, 2012. The New Hampshire Union Leader's endorsement of Chris Christie for president has drawn fire from an unexpected quarter: another newspaper. A few days after the influential New England broadsheet threw its support behind Christie, Tom Moran, the editorial page editor and columnist for the New Jersey Star Ledger, which has been critical of the New Jersey governor, wrote a piece criticizing the Union Leader's endorsement. "The paper knows almost nothing about his record as governor," Moran writes, noting of the Union Leader, "the paper has been paying close attention to Christie's speeches in New Hampshire, and his visit to the editorial board. And that's a dangerous game when it comes to a slick character like our governor." But did you notice something? Not once does Tom Moran mention that his own paper endorsed Christie's reelection for governor in 2013! How about pension reform? The board in Manchester did not know that Christie broke his core promise on that by skipping pension payments. "I don't know if we went into the weeds on pension reform," Bosse said. The editorial said he "dealt admirably" with Sandy. That would come as a shock to the actual victims, 60 percent of whom say they are dissatisfied with the state's response. On jobs, the paper saw no reason to check Christie's dismal record. "Politicians don't create jobs, so we didn't want to give that any credibility," Bosse said. How about the nine credit downgrades on Christie's watch as governor? "That largely stems from the fact that while he's been successful holding back tax increases, he hasn't been as successful in restraining spending. Credit agencies like taxes. They don't reward states for fiscal discipline." When the pension reforms of 2011 were passed, Moran and his crew at the S-L never bothered to ask how Christie would come up with the payments that were required under Chapter 78. The only people who seemed to care to ask the question in real time were crazy teacher-bloggers and, lord love them, the Asbury Park Press, who pointed out that that the state was going to have a hard time coming up with $5 billion a year to make the pension whole if they didn't start raising taxes. During the 2013 campaign for NJ governor, not one moderator in the debates thought it was worth anybody's while to ask how either candidate was going to come up with the money to make the pensions whole. And yet Moran went ahead with his endorsement of Christie, despite never having addressed the issue. All problems he acknowledged in his own endorsement of Christie in 2013! Those are Moran's own words in his own endorsement of Christie back in 2013. So why would he claim these things disqualify Christie from winning the White House, yet they weren't disqualifications for Christie winning Drumthwacket for a second term? What is it that earns Buono such opprobrium from Tom Moran and his posse? Surely, they would mention her worst transgression first; surely, they would cast the first stone at her for her most terrible, her most heinous, her most unforgivable sin. Think about this for a minute. Moran and the S-L admit property taxes have skyrocketed under Christie, despite his claims that he's reined in taxes on the middle class. They admit Christie is waging war on the poor and the environment. They admit he is a fraud on the budget, they admit he is neglecting the state's infrastructure, they admit he has dangerously politicized the courts, they admit he is an out-of-control egomaniac, they admit he steers contracts to his political patrons, and they admit his handling of Sandy was less than admirable. But all together, none of this matters nearly as much to the S-L as the fact that Barbara Buono has earned the support of the NJEA and AFT-NJ. This so important to Moran that he mentions it first in the list of the reasons why the S-L won't back Buono against an admittedly failed governor. The Star-Ledger's jihad against the NJEA is a troubled and troubling obsession on the part of Moran and his editorial board. How deep must their hatred of teachers unions run that all of Chrstie's failures - failures they admit in their very endorsement of him - are swept aside so they can, once again, take a swipe at the only organizations in the state that stand for teacher workplace rights? Moran knew Christie was a disaster of a governor back in 2013. But he could never, ever allow a candidate to be installed in Trenton who had the backing of the teachers union. So no matter how incompetent Christie may have been... at least he hated the NJEA! Tom Moran ignored Chris Christie's many, many failings and endorsed him for reelection as governor for one reason: Christie was willing to go to war with the New Jersey Education Association. In Moran's bizarre world, Christie's jihad against the teachers union was more important than solving the pension problem, or adequately managing Sandy relief, or keeping the state's credit rating up. Tom Moran is the most shameless type of hypocrite imaginable. He looks down his nose at another newspaper for ignoring the facts about Chris Christie -- the same facts Moran ignored just so he could stick it to teachers and their union. The Union Leader was wrong to endorse Chris Christie, arguably the worst governor in America. But it's beyond belief that Tom Moran would scold another newspaper for ignoring Christie's record when Moran's own hatred of New Jersey's teachers unions led him to endorse Christie only a couple of years ago. I don't know about the rest of you teachers in New Jersey, but speaking for myself: I've had enough of this foolish, feckless clown and his idiotic editorial page. I feel badly for the many fine reporters at the Star-Ledger, but I'm not going to spend my hard earned money supporting a newspaper that employs an editorial staff that repeatedly ignores the truth about what is happening in this state just so it can beat up our union. If Tom Moran wants to continue to wage his obsessive and illogical war against the NJEA, he's going to have to do it without my support. How about the rest of you? The Star-Ledger Editorial Board, doing what they do best. Bosse didn’t like that, responding Tuesday night on MSNBC’s All In with Chris Hayes. The Star-Ledger did endorse Christie for governor in 2013, but recantedon that endorsment just a few months after the election. “You want to stick with that metaphor, Mr. Bosse?” Hayes asked, with raised eyebrows. “Yeah, they’re just going around saying bad things,” responded Bosse during the interview. “Maybe their headline should have been newspaper that endorses Christie slams newspaper that endorses Christie." This is a first: The New Hampshire Union Leader newspaper that just gave Gov. Chris Christie its coveted endorsement for president is aiming its fire at me now, saying that I'm acting like "Chris Christie's crazy ex-girlfriend." Like any crazy ex-girlfriend, I can't let that be the last word. So, for a moment, please hear me roar. Let's start with this: Why does the crazy ex have to be a girl? Aren't boys sometimes crazy, too? What about the guys who post naked pictures of women who dump them? Couldn't the paper at least call me a "crazy ex-lover" to be fair? On to crazy ex-girlfriend. That's based on the fact that the Star-Ledger endorsed Christie for re-election in 2013, and has soured on him since. I offer two explanations for that. One is that elections are about choices, and the Democratic candidate, Sen. Barbara Buono, was not ready for the job. She ran because all the major players in the party were scared to challenge Christie at the time, given his post-Sandy bump. Yes, Cory Booker, I'm talking to you. Endorsements, sadly, usually boil down to picking the less bad candidate. That's not complicated. If this primary came down to Christie versus Donald Trump, we'd endorse Christie again. That's life. "Sen. Barbara Buono, was not ready for the job." Seriously? After serving seven years in the New Jersey General Assembly she was elected to the New Jersey Senateon November 6, 2001. Buono served in the Senate on the Budget and Appropriations Committee (as Chair), the Intergovernmental Relations Commission and the Joint Budget Oversight Committee. She was the first woman to serve as Chair of the Senate Budget and Appropriations Committee. At the beginning of the 2010 session, Senator Buono became the first woman to be elected Majority Leader of the New Jersey State Senate. She held the position through the end of the 2011 session, when she was succeeded by Loretta Weinberg, after Buono declined to agree with Senate President Stephen Sweeney on the terms of a power-sharing deal. I mean, how much more ready could Buono have been? By 2013, Barbara Buono had more experience in Trenton than Christie and Booker combined. As I say above: the first reason Moran himself gave for giving the nod to Christie over Buono was that Buono had won the endorsement of the NJEA. It didn't matter that Buono was highly qualified for the job; it didn't matter that even the Star-Ledger's editorial board had to admit Christie was a disaster. All that mattered was that a union whose membership is about three-quarters women had endorsed Buono. So, Tom: who's really the sexist here?